"The Price of Sand" is a one-hour documentary film that started when Jim Tittle heard about a plan to put an open pit silica mine in his mother's quiet rural Minnesota neighborhood. A few basic questions led him to Wisconsin, where a "frac sand gold rush" was already in full swing. Sand mine neighbors, experts, protestors and politicians all spoke to his camera. 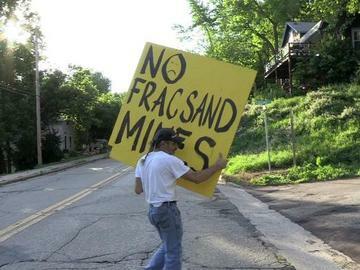 Complete with aerial views of massive new sand pits and microscopic imagery of toxic silica dust, "The Price of Sand" explores the real price of frac sand, not just in dollars, but in lives, communities, and the future of the region.